When you have a pair of boots that you love, you want to keep them in top-top condition so they continue to look great. That means you need to take a little care when you store them. Tall boots don’t hold up in the long run if you just toss them in a closet and let the tops fold over this way and that. 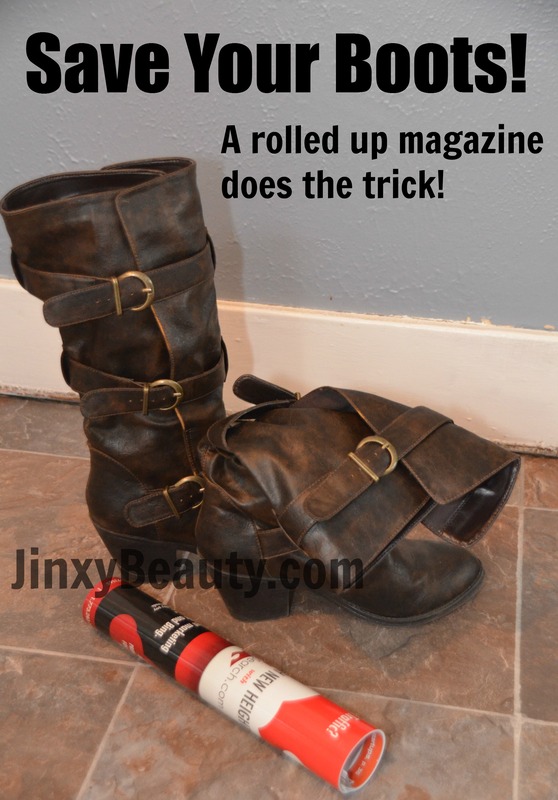 An easy and FREE way to store them properly is to use a magazine. Just grab your discarded copy of In Style, Vogue or Cosmo (or whatever you might be reading) and loosely roll it up and stick it in your boot. Your boot will stand at attention straight and tall and you might even find your closet looking a bit more organized! This entry was posted in Fashion and tagged Tips on April 17, 2013 by Chrysa.